Got to Nashville, they did a fun scavenger hunt during the breaking the ice welcome thing for first timers which was very fun. I met some new people there that I had fun seeing throughout the conference. But most of us were just super pumped for the days to come. That night we got set up, and went to bed starry-eyed about the possibilities of the conference. Ok, Thursday was AWESOME! After listening to an AMAZING keynote by Denise Grover Swank, I spent a few minutes at my table, before going to a panel with Marissa Meyer and Amy Bartol about word building. It was so interesting to hear the different approaches to writing, particularly as I start plotting an entirely new series! Loved it, and learned so much. Next, I got my copy of Cinder signed by Marissa (AAHH! 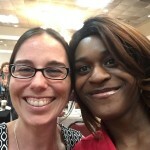 ), had lunch with Amy Bartol (!!! ), Rachel Higginson, Heather Lyons, and Jamie Harris. Can you say little fish in a big pond?! That night I got to have dinner with some old and dear friends, which made the trip that much more special. Friday I got to get a copy of Love and Decay by Rachel Higgenson, signed of course, and went to a panel with Amy Bartol and Denise Grover Swank to name a few, about the future of the publishing industry. By far, this was my favorite panel. They were all coming from such different backgrounds (some were traditionally published, some were indies like me, others were hybrids) so it was awesome to hear how many different roads you could take to success. Loved it. Friday night UtopYA hosted a Karaoke party, which was amazing and totally fun. All in all, another awesome day in Nashville. Saturday was my last day, since I left at 3 am on Sunday morning so I could get home for Father’s Day. It was the signing day, so basically they opened the doors to the public and let them wander the author’s tables and buy books, chat about books, and do all things books! It was so fun! 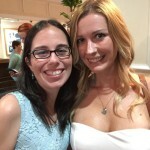 Saturday night was the awards ceremony, and Amy invited me to sit with her (!!!). So I got to be at her side when her book, Sea of Stars, was named Book of the Year and she was named Author of the Year. I was so grateful to be able to share that moment with her, and so filled with pride for her. She totally deserved it, and I’m still so freaking excited for her. That about sums the trip up. Overall, I’d do it again with some small changes. Here’s hoping we can afford to go again next year!! Looks like they have some amazing things planned already! 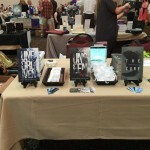 Did you go to UtopYA this year? How was your experience? Planning to go next year? Let me know in the comments! 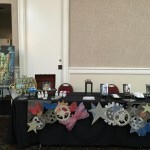 My table mate, Joanna Morris, did an amazing job with our table decorations! 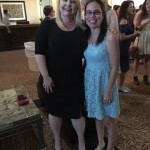 That’s me and Marissa Meyer!!!!!!!! 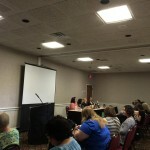 Thursday panel about world building with Marissa Meyer and Amy Bartol. 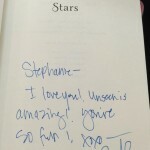 Amy Bartol signed my copy of Sea of Stars!! 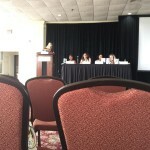 This panel included big wigs like Amy Bartol and Denise Grover Swank discussing the future of the publishing industry. At the Saturday Signing, a member of my Street Team, Ashley, came to meet me!! Made my whole day! 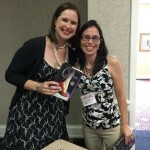 So fun to have this opportunity to meet readers! AMY BARTOL for the win! 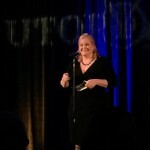 She took home four awards this year, including Book of the Year for Sea of Stars, and Author of the Year! 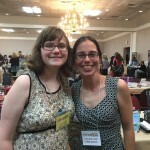 My daughter and I attended UtopYA this year, and had a blast. The people were lovely and I was pretty excited to share a table with Katie McGarry!! (she was so nice, by the way) The panels were very interesting and the awards were tons of fun.